Check out the article about Tufts’ new Data Lab on the front page of the Arts & Sciences Website! The newly expanded Data Lab on the Tisch Library’s second floor is lined with poster-sized infographics and maps created by Tufts students using geographic information systems (GIS) technology. The design of the instructional computing classroom and research workspaces in the lab fosters GIS collaboration and innovation across Tufts campuses and departments. Originally, GIS courses were offered almost exclusively to graduate students within the Department of Urban and Environmental Policy and Planning. Since Florance arrived at Tufts in 2006, the demand for GIS instruction has increased dramatically, especially in the last four years. Today, more than 500 undergraduate and graduate students use GIS mapping and data analysis in courses offered in departments including environmental studies, earth and ocean sciences; public health; urban and environmental policy and planning; civil and environmental engineering; international relations; biology; and many others. Introduction to GIS fills to capacity every semester and is offered within the international relations and environmental studies departments, but allows students to pursue research in any area of their choice. Other GIS courses explore the environment, catastrophes, agriculture, medicine, public health, food, and more. The Data Lab—a collaboration of Tufts Technology Services’ Geospatial Technology Services (GTS), the Tisch Library, and the Edward Ginn Library—also provides a variety of short GIS workshops that offer students a chance to learn useful applications and research methods such as an introduction to GPS or GIS for Water Resources. GTS also coordinates student collaborations with faculty on research projects, providing opportunities for students to receive hands-on experience with GIS as well as compensation for their work. Sumeeta Srinivasan, a GIS lecturer who recently came to Tufts from Harvard University, says the beauty of GIS actually lies in its power to convey complex data more simply. “It also helps that maps [in general] can be legible to even the least statistically-inclined person,” she explains. GIS continues to attract students from a variety of majors, and at the Data Lab, students in 22 disciplines can now analyze data in any subfield. “In academia, the humanities are now using data more extensively, especially with the growth of digital humanities,” says Srinivasan. GIS lecturer Barbara Parmenter has taught a wide range of students, including those majoring in political science and urban and environmental studies. One of her students used GIS to create a gerrymandering score for each United States Congressional district. Another rated every acre of land in Seattle on a development scale to understand where the city could best develop to meet energy efficiency criteria. “This broad application of GIS across departments at Tufts is what makes Tufts’ efforts to develop students’ spatial analysis skills so successful,” says Parmenter. 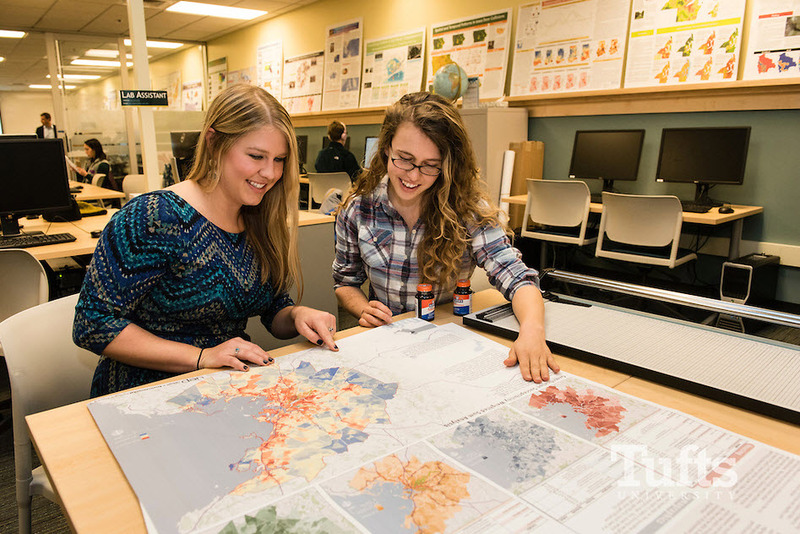 Increasingly, employers are seeking students with GIS experience. Florance points to Dr. Kevin Lane, G08, who worked as a senior GIS lab assistant and trained under Parmenter while obtaining his master’s degree in urban and environmental policy. Lane’s GIS experience helped him win a graduate research fellowship from Tufts Institute of the Environment to conduct an epidemiological study of the effect of proximity to major roads on school-based asthma prevalence in Connecticut. Lane cites GIS research he did at Tufts as pivotal in launching his career in environmental health and planning for a career in academic, non-profit and government sectors as a GIS researcher. “Tufts has a dedicated GIS team that provided the mentoring and support to learn this powerful analytical and communicative tool while working on real-world public health issues,” says Lane. “It afforded me an opportunity to work on a variety of studies very early in my environmental health career.” Now, Lane is a postdoctoral research associate at the Yale School of Forestry and Environmental Studies, and he continues to collaborate with Tufts as a GIS environmental health researcher examining health effects of traffic related air pollution, working with Tufts Professor of Public Health and Community Medicine Doug Brugge and Tufts Associate Professor of Civil and Environmental Engineering John Durant. Looking ahead, Florance says Tufts is leading an effort to collect geospatial data — large data sets used by academic and professional researchers — using the open geoportal federation, an open-source web application that will help discover and retrieve geospatial data from multiple repositories. Other priorities, adds Florance, include developing a more extensive and coordinated curriculum. “With Sumeeta Srinivasan joining the faculty, and infrastructure and consultation services improving within the new Data Lab, geospatial teaching and research will develop significantly at Tufts,” says Florance. In spring 2016, Tufts will host the 10th annual GIS Poster Expo, the largest of its kind in the country. Visit theGIS at Tufts website for details.